Allergy Advice: Contains Wheat Flour, Wheat Gluten Flour, Yeast Extract, Soy, Soy Bean. Ingredients: Noodle (80%): Quality Wheat Flour (76.5%), Tapioca Starch (6%), Potato Starch (6%), Water (4.6%), Wheat Gluten Flour (4.5%), Salt (2.4%). Paste Seasoning (10%): Palm Fat (38%), Curry Powder (12%), Salt (12%), Flavour Enhancers (E621, E627, E631) (19%), Sugar (8%), Yeast Extract Powder (8%), Chilli Powder (3%). Seasoning Powder (5%): Salt (34.5%), Spices (Chilli, Cinnamon, Fennel) (21%), Sugar (17%), Flavour Enhancers (E621, E627, E631) (13.2%), Food Starch (7.9%), Dried Onion (2%), Soy Sauce Powder (2%), Anti-caking Agent (E551) (1%), Paprika Oleoresin (E160c) (0.6%), Acid Regulator (E296) (0.5%), Caramel Powder (E150c) (0.3%). Soy Sauce Seasoning (5%): Sugar (60%), Caramel (18%), Soy Bean (15%), Flour (3.5%), Salt (1.5%), Brown Sugar (1%), Flavour Enhancer (E621) (1%). 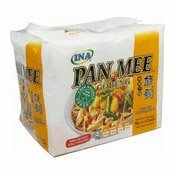 Simply enter your details below and we will send you an e-mail when “Pan Mee Goreng Instant Noodles Multipack (Curry) (咖哩板麵)” is back in stock!